Brother Martin's middle weights, none of whom were starters last season, stepped up their game tremendously against crosstown rival Jesuit at Brother Martin Wednesday evening. Between expected wins by Taylor Gambill at 138 lbs. and Pierce Williams at 170 lbs., Cal Palermo (145 lbs. ), Kevin Casey (152 lbs.) and Brad Guidry (160 lbs.) amassed 12 team points for the Crusaders in their 41-18 dual meet victory. Had those points gone to Jesuit, the Blue Jays would have left with a 30-29 win. The need to "step-up" was due to two unexpected losses in the lower weight class. Jesuit's Eli Larriviere defeated 2015 Division I runner-up Steven Rumney 7-4 at 126 lbs. Rumney's only previous losses were to Airline's Javarious Jones, and last season Rumney defeated Larriviere 10-5 and 10-3. Following that, new Blue Jay starter Jackson DeGruy, sporting only a record of 7-10 against Louisiana competition, won a 9-8 decision over Seth Gambill, who is on pace to be a #1 or # 2 seed in the Division I state championships in Bossier City. DeGruy, should he keep doing well in upcoming events (Jesuit has the Ken Cole Invitational, the Dale Ketelsen Invitational and the GNO Championships remaining on their schedule), should find himself among those meriting high seeds in Bossier City. After a major decision by Taylor Gambill at 138 lbs. put the Crusaders up 13-6, Palermo defeated William Rosevalley 11-6 for his second win over the Blue Jay in five days. Casey followed that with a 12-6 win over Griffin Mason at 152 lbs., avenging a Louisiana Classic 11-5 loss to Mason last Friday. Guidry, at 160 lbs., pinned Brandon Wolff in 1:30 to give the Crusaders a 25-6 lead. Three other matches could have gone Jesuit's way. At 106 lbs. Colby Queyrouze ran out of time trying to complete a third-period comeback and fell to Daniel Varnado 8-7. And in a rematch of the Louisiana Classic finals, Steven Shields again got past Joseph Dupre by a point in a 3-2 match. Between those two matches Brother Martin's Luke Cotton probably got a little more than he expected from Jesuit freshman Luke Eccles, who was 6-5 entering the match yet only lost to Cotton 10-7. In the remaining matches Pierce Williams (170 lbs.) and Travis Viener (182 lbs.) added falls for the Crusaders, and Nathaniel Perdue (220 lbs.) scored an 11-3 major decision. 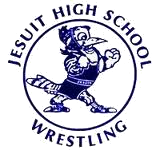 Jesuit's Guy Patron, Jr. scored a fall for the Blue Jays at 195 lbs., as did Corey Dublin at 285 lbs. That Jesuit came close in several matches does not put the Blue Jays in a place to really challenge the Crusaders for the Division I state championship. It does, however, send a clear message to St. Paul's, who has been considered the second best team during most of the season, that the Blue Jays are not ready to relinquish the runner-up spot just yet.